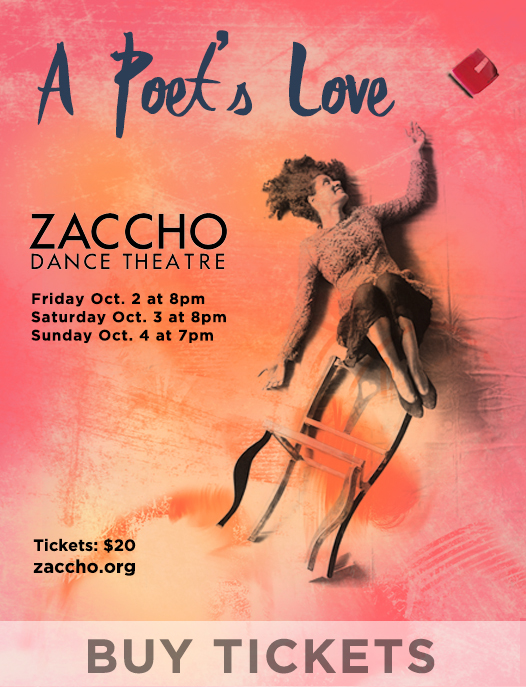 Reserve your tickets to A Poet's Love at Zaccho Dance Theatre! Join Zaccho Dance Theatre for the world premiere of A Poet's Love, a new work by choreographer Joanna Haigood and Brooklyn-based tenor/actor José Joaquin Garcia. A Poet's Love is based on the Dichterliebe song cycle by classical German composer Robert Schumann. A Poet's Love takes the form of sixteen discrete vignettes, each one responsive to and deeply immersed in the musical and poetic context of a song in Dichterliebe. Zaccho Studio in San Francisco and will feature members of Zaccho Dance Theatre's performance ensemble as well as José Joaquin Garcia and well-known Bay Area pianist Frederick Harris. To accommodate the piece, there will be No late seating for A Poet's Love. Please plan ahead to arrive on time. Those attending on Friday, Oct. 2 may join us for a reception after the performance for a chance to mingle with the artists and creators. This performance is made possible through generous support from the National Endowment for the Arts, the San Francisco Foundation, the Zellerbach Family Foundation and the W A Gerbode Foundation.